Having the option to retreat to your own private island whenever you damn well please is a luxury reserved for the likes of Richard Branson and his uber-rich friends. But what if you could simply unmoor your own home from the land and turn it into an island whenever you felt like it? 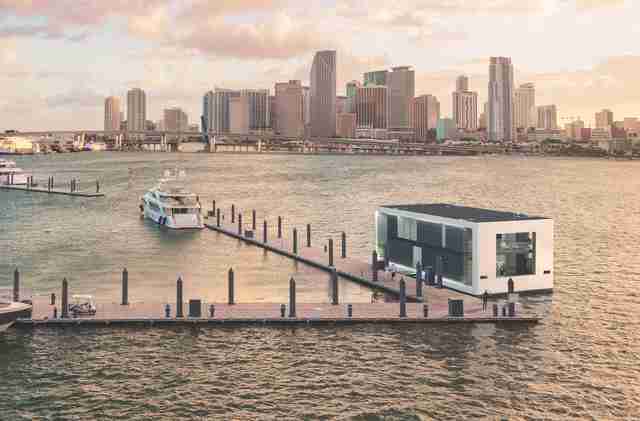 That's the whole idea behind a new company designing floating "villas" that blend the luxury of yacht life with the logistics of a houseboat to enable people to pick up and park their homes offshore on a whim. The notion of living in a house that's also a boat -- or vice versa -- is certainly nothing new. There are entire neighborhoods and marinas of such things in coastal cities around the world. 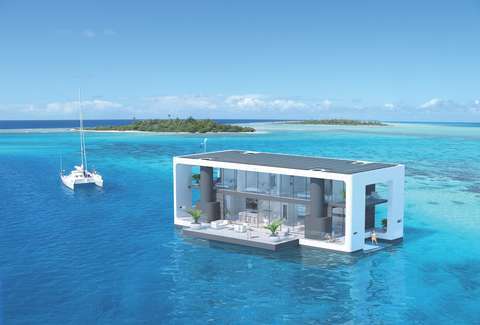 However, Arkup, the company behind this new floating villa concept, is taking the idea to a whole new level. 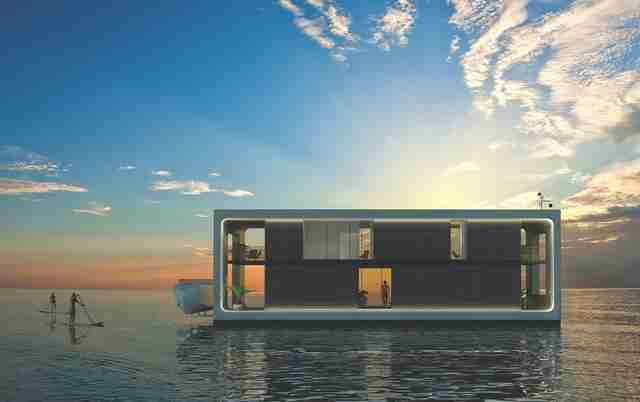 Unlike traditional "houseboats," which are generally designed to remain stationary on the water and require a lot of planning to move, the ones envisioned by Arkup would be capable of leaving their docking station and relocating to a new area out in the open water via built-in electric propellers. Also, each house is equipped with what are called "spuds" under its hull, which function like a set of hydraulic stilts to raise the whole rig above the water level to protect it and any seasick-prone people lounging inside from particularly choppy water conditions. As you'll notice from the above photos, they're also distinctively high-end. The minimalist, modern aesthetic evokes the sort of sprawling house you might expect to find hosting some Miami Beach pool party. As designed, each one boasts 4,350 square feet of living space, including four bedrooms, 4.5 bathrooms, and a couple of open-air decks. You also wouldn't have much trouble scoring a killer view of sunset or sunrise anywhere inside thanks to the bountiful panoramic windows. As for how these might fare in sketchy weather, they're actually designed to handle hurricane-force winds up to 155mph, and those aforementioned hydraulic "spuds" can be lowered to protect them from storm surge or flooding. In fact, the Arkut team is actually pitching them as an alternative type of housing in the age of imminent rising sea levels for people who want to keep living it up on the coasts -- or even on rivers or lakes -- without the threat of losing their home. They're also capable of existing sustainably "off the grid" thanks to a roof full of solar panels generating electricity, a unique waste management setup, and a rainwater harvesting and purification system. Unfortunately, there is one major downside to the whole endeavor: the cost. If you're really interested, you'll want to start saving up stat, because as it stands, buying one will set you back a cool $3.5 million.